My visit to New York City was busy and full of dogs and dog people, starting with the Dog Writers Association of America awards dinner. This event is always the Sunday before Westminster and, in spite of being asked to present the awards at the last minute, I still managed to catch up with friends I only see once a year, and to meet some new ones. As an added bonus, I won the American Kennel Club Reunite award for a column I wrote about the importance of microchipping. I’m not sure what the laws are pertaining to dogs in a dining room, but we had several in attendance. Dexter is a Cocker Spaniel belonging to Carol Bryant, who writes a blog, “Fidose of Reality” that frequently features her well-behaved dog. 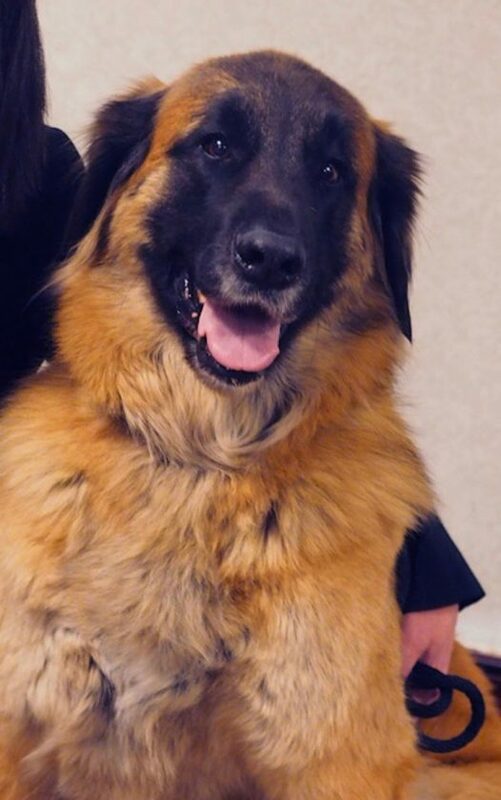 Mara Bovsun, editor of AKC’s “Family Dog” Magazine was there with her gorgeous Leonberger, Emily. Leonbergers are large dogs and Emily could easily have eaten everyone’s dinner, but she minded her manners and never touched anything on the tables. Also in attendance were a Boston Terrier, a Chihuahua, a blind and deaf Dachshund-Chihuahua cross named Piglet, and a standard Poodle called Stanley, belonging to the keynote speaker, NBC’s Jill Rappaport. My favorite quote from Jill’s speech was when she was talking about her many dogs. She said she had, “too many to be called sane, and not enough to be called a hoarder.” Many dog people can relate to that quote. The other speaker that night was Steve Dale, a columnist and radio show host from Chicago. Years ago, Steve did several interviews with Lucille Ball, and he spoke about Lucy’s dogs during one Lucille Ball Festival. Monday and Tuesday nights were devoted to watching the group judging at Madison Square Garden. For anyone who hasn’t heard, the wire-haired Fox Terrier won Best in Show, with the Havanese taking reserve. I know all the dogs were good dogs and deserving of the final award, but I was very disappointed that the long-haired Dachshund didn’t win. By the time the dogs reach the Best in Show ring, sometimes the choice comes down to the dog who “asks for it” and I think the Dachshund did just that. I was also disappointed that the Schipperke who won the non-sporting group wasn’t able to compete. I like these energetic little black dogs and I think he’d have given the other dogs a run for their money. Unfortunately, one of the owners had a connection with the judge, Peter Green, so they withdrew the dog from contention. Another disappointment had nothing to do with the dogs, but rather with the audience. They were particularly loud when they liked a dog, which was fine. It’s fun to cheer for your favorite. What isn’t appropriate is booing. I don’t think I’ve ever been to a dog show where anyone booed, but this year, at Westminster, when the crowd favorite didn’t place in one of the groups, the audience booed. I can’t imagine how that made the fourth-place winner feel as he was accepting his ribbon. Breed judging was held Monday and Tuesday during the day at Piers 92 and 94, with shuttle buses running between the Hotel Pennsylvania and the New Yorker Hotel and the piers. I missed most of the Pembroke Welsh Corgi judging, but did watch Italian Greyhounds and Cavalier King Charles Spaniels being judged. I enjoy watching breeds that I’m not as familiar with so I can learn something about them. I also saw one of only two Norwegian Lundehunds entered. These rare dogs were bred to hunt cliffs for puffins and have multiple toes on each foot to help them climb among the rocks. There was also time to wander among the vendors, admiring all the dog-centric merchandise. Of course, the show wasn’t the only place to see dogs. The lobby at the hotel always had several dogs and I was delighted to see a cluster of Ibizans, both smooth and wire. These large sight hounds always seem so happy and playful. An advantage to seeing the dogs at the hotel is that it is easier to talk to the owners and to pet the dogs without worrying about mussing up the grooming of a coated breed. I had a busy, dog-filled visit to New York, and loved every minute, but it was still good to come home and be greeted by Gael and Tegan.